JD Roberto may not be the first name you think of when you hear “game show host,” but maybe he should be. His career path as a presenter looks more like what you would think a game show host’s resume should look like, as opposed to ‘failed actor’ or ‘stand-up comedian looking for work.’ I sat down with JD to talk about where his career started, and how it ended up on BYUtv’s newest game show Battle of the Ages, premiering tomorrow on BYUtv and BYUtv.com. This interview has been edited for clarity and length. Hey, JD. It’s really great to talk with you. Very excited about the new show! I’m very excited too. I will be honest and say, well—you know how it is. You know game shows as well as I do. Like, there’s not a lot of new game shows being made and certainly not ones where they don’t hire some sports star or some comedian or like… for guys like me who are just traditional game show hosts, there are not a lot of opportunities. So I am over the moon about this one. So let’s start with your history in game shows. First and foremost, I know you from Shop ’til You Drop. Yes. The second iteration, right? The Pat Finn version was first and then they kind of re-did it for PAX and I was the host for the second iteration of it. Yeah. I think Shop ’til You Drop was—you know, it was usually paired with Supermarket Sweep; it felt like the little brother, you know, but I think a lot of people kind of slept on STYD. What was the experience like for you on that show? It was the sweetest thing ever. I went into it with a pretty good feeling because I kind of had Pat’s blessing, but was a completely different show. I think looking back on it this many years later, maybe my version was maybe not as compelling as Pat’s was with all the stunts and all the craziness… there was something incredibly fun about Pat’s version. I loved our version of the show, don’t get me wrong, but, um, I think a lot of fans were attached to the original version and I totally understand why. I did meet a lot of people on that job that went on to be really big in game shows and TV and who stayed in my life. Uh, the directors, Bob Loudin and Steve Grant became kind of mentors for me. From a full circle perspective, the woman who was stage manager on STYD, Tracy Eskander, was stage manager on battle of the ages. So it was very fun to see her again. You know, I had done a tiny little regional game show in Florida called Flamingo Fortune, which was short lived. It was the state lottery game show. I’m sure you’ve seen these around the country. Jonathan Goodson at the time was producing those all over the country. So he came down to Florida. I was working at Disney, I was dating a nice girl and I, after a long series of auditions, having never hosted anything in my life, I got this job hosting this game show. And I was terrible. I was so bad. But, I met Jonathan and I met Andy Felsher, met Jeff Palmer, Gary Dawson and I met all of these people that had been in the business forever. So when this cute girl and I (who I eventually married and had kids with) moved to Los Angeles, my first call was to Jonathan Goodson in to say, “Hey, I, you know, I was terrible on that job, but thank you so much for the opportunity.” And he called back and said, “You weren’t terrible. You’re just new. Why don’t you come on in here and we’ll do some run throughs with you and I’ll introduce you to my agent.” Jonathan was very formative for me getting off the ground. 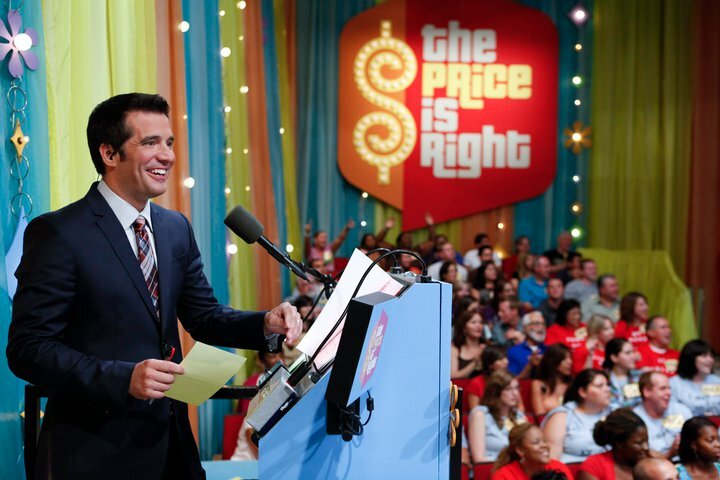 Andy Felsher would later on hire me to do The Price is Right: Live. I still do TPiR: Live every now and again along with Todd Newton and Mark Walberg and all those guys. So those, all those people have stayed in my sphere over the years. And really I think driven home my love of game shows by getting to work with them early in my career. It’s really interesting that you bring up how you’ve come up in the entertainment industry because I think it shows that your pedigree as a presenter is kind of grounded in a more traditional presenter role—as someone who kind of understands how to not just get the best out of strangers who have never been on television before and how to get the best out of them, but also how to keep a program moving. Who really guided you in the, the specifics of, of how to be a presenter? That’s a great question. I think there was a lot of trial and error. I tend to watch myself on tape a lot—still to this day, I’ll watch myself on tape a lot and critique myself a lot. Uh, Gary Dawson’s job on Flamingo Fortune was Host Coach, because they knew I was new to it. So he came down and he talked to me a lot about, you know, the role of traffic cop, which is a word you and I would throw around with ease around game shows, but I’d never heard it at the time. That was a particularly challenging show, because on a traditional game, the contestants are at least screened, but on these lottery games shows, if they win on a certain ticket? They’re on the show. So it was super challenging. It’s sort of a trial by fire: how do you get the most out of people who, you know, not only are not television professionals but really would never in a million years had been put on a regular game show where you have some level of vetting process? All of that leads us into a really good segue of, well, a lot of things I want to talk about with Battle of the Ages. Because I think from… from many different aspects, Battle of the Ages is something really interesting. From a casting perspective, they’ve cast someone who is a traditional game show host. From a production perspective, this is on a—I’m just going to say: it’s a weird network to put a game show on. [Laughter] I get it. I totally get it. I totally get what you’re saying. I did not know Brigham Young University had a television channel. Because when you hear, you know, BYUtv, it’s like, “Okay, the channel of Brigham Young University… So, JD’s doing work for someone’s senior thesis? I don’t understand…” But to see what they’ve done with the network over the past almost 20 years now at this point, and the shift that they took… you’re kind of back where you were before because BYUtv now is a lot like PAX was at the turn of the millennium. You know, you’re 100% on it. None of this will be new to anyone who watches BYUtv. It’s very evident that they have a pretty dedicated following. So, you know, none of this is new to them. But what’s nice is that there’s no ads. So you have, yeah, not 22 minutes. Now you have 26 minutes. We did talk a lot about like, take your time, have fun. There are no commercials. Just enjoy yourself and if something’s good, let it go. Let it keep going. I mean, I got a lot of leeway from the producers to, if I’m having a good moment, do not feel the need to move it along and get back to game play, have fun. Let the contestants have fun. We’ve got time. And I, I think that’s most evident in the premiere where you’re doing pirouettes on stage with, you know, a kid and his grandpa. Now talking, I see this parallel between you on Flamingo Fortune, um, dealing with, you know, scraping for something with contestants to now kind of using that skill to get the best out of these families. Yeah, the families were absolutely magical. Everybody showed up ready to have a good time. You know, I’m also at a different place in my life. I’m a dad. I’m not a twenty-something kid who’s dying to be on TV and just wants everybody to like him and do a good job and I’ve got a death grip on it the whole time because I’m so worried I’m not going to do it right. I’ve been around a lot longer. I’m a family man. I’m aware that there are not that many opportunities for me to do something like this. So I walked into it with much more of ‘I’m just going to leave it all on the floor’. I’m going to give it 100%. I’m going to give my most real authentic JD Roberto, because the only thing I can do better than anybody else is be me. It’s the only thing I’ve got that nobody else has. So I’m just going to do it. And I think it’s really liberating to be a little bit older and a little bit wiser and to go into a show like this, you know, with the handcuffs taken off and the concern about being the best or being perfect thrown off so I can just go in and have fun. What attracted you to this show specifically? I love the family friendly nature of it. I have a nine year old and a 13 year old and we struggled to find stuff and everybody can watch and enjoy. I mean, it’s easy to find stuff that’s appropriate for them and it’s easy to find stuff that’s appropriate for my wife and I, but to find something that we can all watch and we can all have a good time with—that’s tough. And we, and you know, we’ll watch Ellen’s Game of Games together. My kids love that. We love that we can have fun. We’ll play some board games together. But to know that people that have the pedigree of, you know, David Hurwitz, Peter Herschko, Richard Allen Brown—these guys were putting this together, soyou know that you’re in good hands. These people know games. They are absolutely dedicated to their craft. They’re not there to make a buck. They’re there to make a great show. So I knew that going in. So that was super attractive to me. I loved the concept of the show because I loved the idea that there would be amazing comedy from, you know, grandma and teenager having to work together or rolling their eyes because one of them knew stuff and the other one didn’t. But I, but it was never ever going to be mean spirited. We were never going to make our bread-and-butter making anybody look bad or feel bad; that, at the end of the day you have to be able to go on that show and lose and still have an incredibly fun time. I mean, that’s an attractive way to work, to get to go to work everyday, knowing that everyone you interact with is going to have a good day. I’m getting, I’m getting too old to be involved in sort of nasty, ugly reality TV. I don’t want my kids asking me what I do for a living and having to say, well, you can’t watch it because it’s not appropriate for you. I mean, no father wants to do that. I want to say, oh my God, guys, you know what I did this weekend. Come here and watch it with me. We’re gonna have a blast. From a fan perspective—since, I don’t have kids yet but I like TV a whole lot—there’s a lot of stuff in this show that is very comfortable. It’s very familiar, which is nice, you know? I think game show fans can at least watch one or two episodes and if it’s not their cup of tea, they’re not going to say, “This is stupid.” They can at least see the merit that goes into it. If you saw the premiere that you saw some of them, but they’re—I don’t want to give you a number because I don’t want to be wrong, but there’s something like 30 to 40 different games that we play. [Editor’s note: Close, JD! It’s 28 games.] There are six to 10 characters. I think you saw… was there a character in the one they premiered? There were two of them. There’s the video game man and the DJ lady. All right. So yeah, DJ Patty P, uh, and you had Stanley Streamer… so those guys make appearances later in the season, but there’s like half a dozen other completely different characters and they’re hilarious. And the actors, the improv guys who do them are great. Every game show game boils down to how many answers can you get this amount of time to get your x number of points. So the game is really how creatively and how fun can you make the process of getting and giving those answers and getting those points. And I was blown away by how many games they brought to Utah to the shoot. We didn’t end up using all of them, but I mean, they brought dozens and dozens of games that I had never seen before. I wasn’t like, “Oh yeah, that’s just a dressed up version of such and such.” I was really impressed. They’re all familiar as you say, we’re not reinventing the wheel, but they’re not totally like, rehashed. Yeah, I think there’s been a few shows in the past couple of years where, um, I could really say, you know, “This show definitely took this element from this show, this element from a different show and just plopped it down.” But with Battle of the Ages, they’re doing really well in taking inspiration from shows that are familiar, and making it their own, which is a testament to the show runners and the creators. Beforehand, did you have to learn all of the games or did you just wing it? So they, I got scripts and outlines of games well before the shoot and then I went out to Utah five or six days before our first tape day, while they were still loading in and building the set. I just sat with the game producers. We went through game after game after game and they were actually really lovely about it. They let me—I don’t want to say “rewrite”—we adapted all the copy so that it sounded correct coming out of my mouth. So I wasn’t just reading game rules. We would do, we just logical game show stuff where you’re like, “Well, I feel like if we set it up like this, we don’t have to say these seven rules. Everybody understands that you can’t step over the line or you can’t do the thing.” So there was a lot of sort of hashing out and tweaking on the spot and they were really generous with letting me come in and be part of that. And then in the process of that, I learned all the games, which was great. What can fans look forward to in this season of Battle of the Ages? Great play along at home. A great show for the whole family to watch together. Some surprisingly hilarious contestants. I think I do everything from Hula dancing to gymnastics. I get Irish step dancing lessons at some point during the season. There is such a crazy cast of characters this season and just the nicest people you’d want to meet. You’ll definitely want to root for them. And we have some big wins. I can only say so much about that, but we definitely—there’s some nice big wins this season too. I know some game show fans get really hung up on prize winnings. This a not-for-profit television station budgeting $10,000 for a top prize. I mean, that’s, that’s GSN money right there. That’s not bad. Yeah. It’s not terrible. I mean, I get it—we’re not playing Survivor. It’s not $1,000,000 on the line, but for these people and these contestants coming, winning $10,000, that’s amazing. That’s an amazing experience for an hour of their time. By the way, even the people who lose go home having a good time. There is 10 grand on the line—by the way, nobody goes home empty handed. You saw that final round, it’d be virtually impossible to get them all wrong and you get a thousand bucks for every correct answer. So you know, everybody wins something. We had some good fun with some good people. 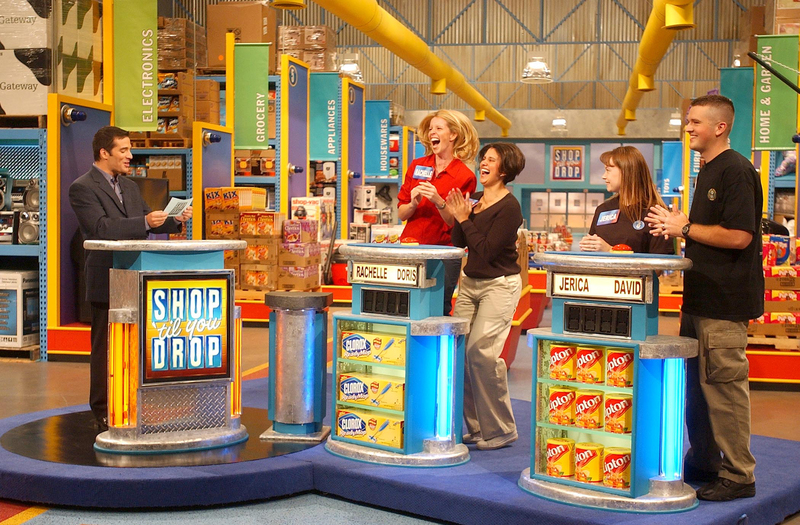 What are your favorite game shows? A huge fan of Price is Right, for obvious reasons. It’s been a part of my life for a long time and I’m a huge fan. Um, I also like Family Feud, I grew up watching Richard Dawson, so getting to work with Gary and also with Kathy Dawson who had been his daughter in law. She had produced TPiR: Live in Vegas that I did for a long time. So a big fan of Feud as well. Those are the two that jump to mind: Price and Feud. I know those are predictable answers, but I’m kind of traditional in that way. Other than those, what show would you want to host the most? You know, I always thought Match Game was insanely fun and it played to my skills which would be setting other people up to be funny and have great moments and traffic copping, talk about the ultimate needing to rein in a panel but also keep gameplay going. Match Game would have been an enormous amount of fun to host. Battle of the Ages premieres tomorrow on BYUtv and BYUtv.com. Check your local listings.